Automakers are connecting cars with technology that lets drivers order food, make reservations and pay for gas, bypassing their cellphones. The car of the future will have powerful communication technology on board. As self-driving cars pull onto the nation’s roads, these advanced abilities will help manage the traffic mix of tomorrow, but they may also change the way we communicate while on the go. Automakers are betting that if our cars have the technological muscle to keep us connected, we will park our phones when we get in and communicate from the dashboard. A side benefit of all this technology is that it will also usher in a range of conveniences. These may include offering drivers options for fuel, food and lodging, perhaps with a bit of a hard sell thrown in. For owners of some General Motors vehicles, a taste of this future is already here. Since December, GM has equipped about 3 million cars with an in-dash system it calls Marketplace. The free-to-use system communicates directly with merchants, enabling a driver or passengers to order and pay for a variety of products and services without a cellphone. Vendors include Starbucks, McDonald’s, Shell, Exxon Mobil, Dunkin’ Donuts, Applebee’s, Delivery.com, IHOP, Parkopedia, Priceline, Wingstop, TGI Fridays, Office Depot and Yelp (for restaurant reservations). Many owners of cars equipped with Marketplace probably don’t even know it’s available. Only about 75,000 people have signed on, and it’s not mentioned in any car manuals. GM wanted to allow time for refinement and for lining up more merchants, but is now starting to promote the system to consumers. 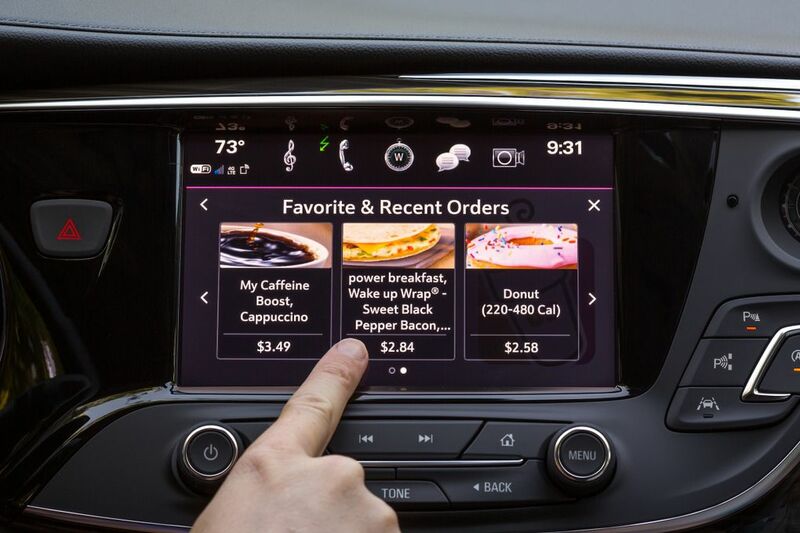 Marketplace interacts with GM’s infotainment system and establishes a dialogue with the car owner. For example, if the car is running low on fuel, Marketplace can provide directions to the nearest gas station. The system allows drivers to sign up for the vendor’s reward program and can point the way to discounted gas. There is no need to swipe a credit card at the pump, because Marketplace handles the transaction and turns on the pump. Marketplace communicates by means of a 4GLT modem that can connect to a cellular network or Wi-Fi. GM was well situated to adopt this technology, because its vehicles have been equipped with modems since OnStar’s debut in 1996. Other carmakers have introduced modem-based communication systems, but GM has made the most comprehensive push into mobile communication and marketing. Rick Ruskin, a General Motors executive leading the connected customer experience, also points out a focus on limiting distracted driving. Automakers have long employed the driver’s cellphone and a Bluetooth connection as the underlying technology for convenience features, but more companies and analysts view this as an inelegant and limited solution. A built-in modem with its own SIM card will eventually become the only way new cars communicate with one another, the infrastructure, the owner’s devices and mobile vendors, said David Liniado, vice president for new growth and technology at the Cox Automotive research firm. SIM cards, which carry an identification number unique to the owner, are now in 130 million vehicles globally, Liniado said. “Bluetooth and the phone are gone,” he added. The driver or front-seat passenger can interact with Marketplace by touching the dashboard screen. Voice command technology is in development, Stefan Cross, a GM spokesman, said. Actions that require considerable involvement and could distract a driver, such as booking a hotel room on Priceline, can be executed only when the vehicle is stopped. Marketplace also limits options. For example, a Starbucks customer can order from the car while it is being driven, but only a few choices, based on previous orders, will be displayed. And the format is standardized so drivers know where to look and what to do no matter which vendor’s page they open, helping them remain focused on the road. Marketplace vendors either pay an upfront fee to be included or give GM a share of sales. It’s not a huge revenue stream, but it’s better than no revenue. Other automakers are taking advantage of in-car communication on a smaller scale. BMW Connected now allows vehicle owners to speak to Alexa from the car, using the car’s onboard modem, no smartphone required. The automaker has not added vendors to its system, but car owners can ask Alexa to place orders. Land Rover’s Touch Pro Duo system communicates via an in-car modem and can find filling stations and provide traffic information. Mercedes-Benz offers a system called Mercedes Me. An app that provides control functions is installed on a cellphone or other personal device, and the car communicates with the owner via the vehicle’s onboard modem. The system enables the creation of “geofence” boundaries. If the automobile is driven beyond a boundary, it sends a message to the car owner. 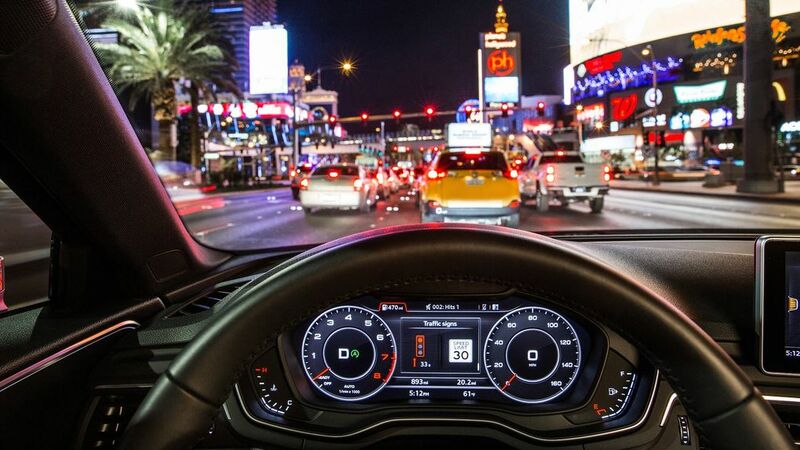 Audi has added a feature called Traffic Light Information, which “talks” to stoplights and can tell drivers how long they will have to wait before the light changes to green. It works only in the few cities, including Las Vegas, Phoenix and Washington, D.C., that have installed the necessary hardware. While automakers and industry consultants are thinking about how in-car communication will work, others, like Bryan Reimer, a research scientist at the Massachusetts Institute of Technology, are thinking about ways to ensure that these features won’t introduce new hazards. Reimer said engineers were devising systems that can determine how often and how long the driver is looking at the road, and issue alerts and warnings if the driver’s attention wanders. All things considered, it seems certain that new car buyers will soon be in touch with almost everything while on the fly, and that this ability will undoubtedly expand. By default, the car will be part of the internet of things. For those driving older vehicles, some retrofitting will be possible. Verizon offers a modem device and feature set, called Hum, that is similar to what is built into new cars and plugs into the onboard-diagnostics port of most vehicles from 1996 and later, and Mercedes-Benz dealers in Britain are retrofitting communication ability in many cars built since 2002.